Hollybeary Creations : NND July Release Day 2!! NND July Release Day 2!! It's Day two of the Newton's Nook July Release and today we are sharing the new set Cocktail Mixers and Stowaway Newton sets...both of these sets also include coordinating dies. My first project features the Cocktail Mixer set and the new Waves Stencil. I added some waves to the background with the Waves stencil and some Blue Nuvo Glimmer Paste. Once the paste was dry I trimmed a 1/4" off the side of the panel and stamped the sentiment in the lower corner. Then I adhered it to a Black card base. I stamped each of the cocktails onto some White cardstock and colored them in with Copics, then I used the coordinating dies to cut them out. I adhered them to the front of the card with some foam adhesive. 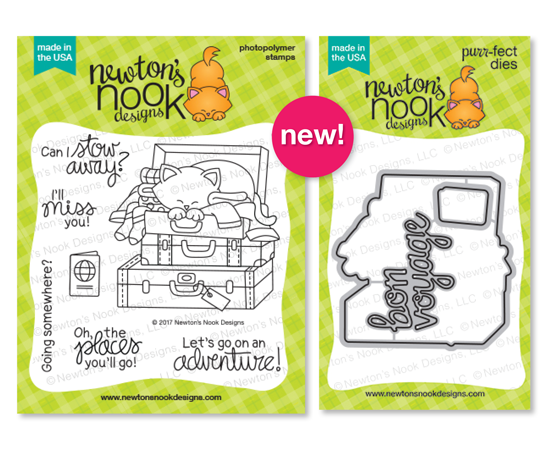 Our second set today is this adorable Stowaway Newton set. I created a card base and then I added some papers from Doodlebug Designs. I stamped Newton onto some Watercolor paper and used some Distress Inks in the same colors from the pattern paper to color the image in. Once the images were dry I used the coordinating dies to cut them out and adhered the image to the front of the card. This set also has a Die-cut that reads Bon Voyage in the set. Love these cards! The glittery waves behind the drink is so pretty and sweet little Newton snoozing in the luggage is just adorable. I love both of your cards. Your cards are adorable and beautifully colored. pairs with this new set. Love the new stencil with the new cocktail set. Wouldn't have bought to put those two together. So awesome, love your cards! I see you used that stencil you made in your video - so pretty and thanks for all the tips! I love them. Those drinks look yummy and I love the sparkly waves on your cocktail card. The papers on your Newton card is perfect and I really like the colors. Love the layering on the suitcase card. What fun to have paper to match the design. 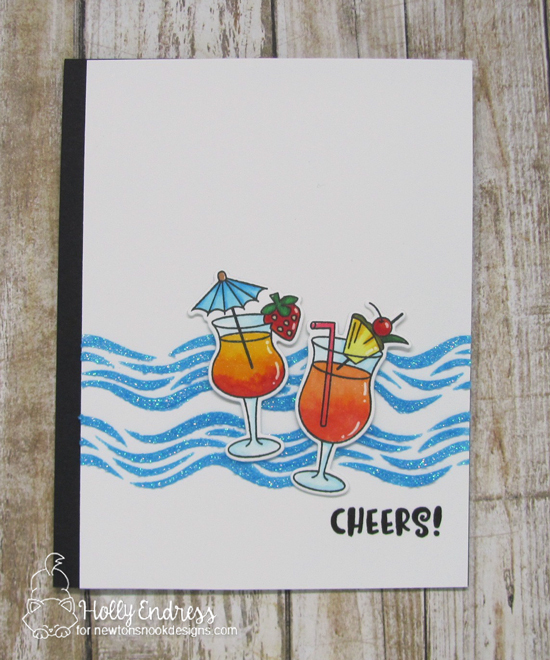 Your drink on the waves are fabulous!! I love how you colored up and layered Stowaway Newton! Cute cards. I like the wave background on the first and the papers on the second. Great summery feel with the cocktails. Lovely cards. 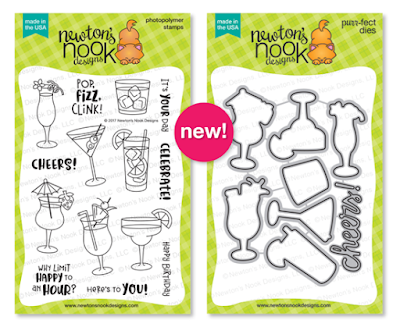 Love the cocktail mixers set. Great cards and love the waves! Awesome cards. Love those images above the stencil on the first card. Fabulous cards! Love your coloring on both cards, and that texture paste looks awesome! Such charming cards - bright and full of color and your coloring is amazing! Definitely feels like summer is here! TFS! Great cards! LOVE the Cocktail Set! Cheers! Both of your cards are just gorgeous. Also love the stencil besides the stamp/die sets. Beautiful cards, I love the stencil and glimmer paste for your first card. Great cards! Love the fun drinks and the textured background! I like both of your cards! They are nice! Feelin' it with your "celebration" card. So fun and lively! The wave stencil and cocktail stamp are the perfect combination. Love your card. Haha Stowaway Newton looks like he's right out of the 60ies! I'm not familiar with distress inks but love how it your travel card turned out!